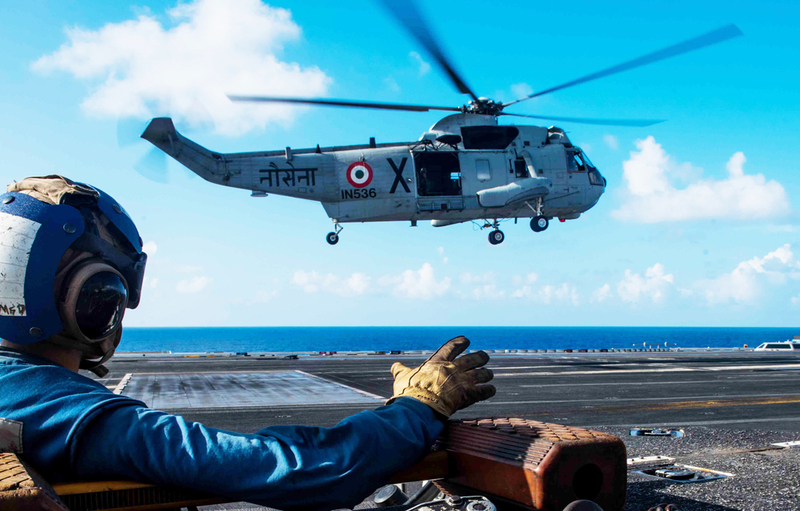 The Indian Ministry of Defence has finally granted approval to acquire 24 anti-submarine and anti-ship Multi-Role Helicopters (MRH) in answer to a decade-old "urgent" requirement. The news does not come a day too soon for the Indian Navy (IN). The proposal is to acquire Sikorsky MH-60Rs (“Romeos”) by a U.S. Foreign Military Sales channel. Earlier a direct-sale of the similar Sikorsky S-70B Seahawk had been approved in principle but foundered over drawn-out price negotiations. The acceptance of necessity (AON) for the MH-60R buy is valid for 18 months, which ordains that the order will have to be made in that time frame. Sikorsky (Lockheed Martin) had withdrawn from the S-70B discussions held for years following a refusal to reduce pricing. The MH-60R deal comes with 30 percent offsets. A request for proposal for the MRH was released 10 years ago to replace the aged and now mostly retired Westland Sea Kings in the Indian Navy inventory. While AIN was unable to get a formal response on why the change in the procurement model was negotiated, a senior official surmised: “The MH-60R comes with American sensors and the FMS route will be faster. The S-70B was with Indian sensors. Both airframes are almost similar.” AIN learned that some changes will be made to the new aircraft, including the adoption of flotation gears similar to those fitted to the Sea Kings. Simultaneously, the Defence Acquisition Committee has also cleared the procurement of 111 navy utility helicopters (NUHs) to be made under the Strategic Partnership (SP) model, the policy of which is yet to be given a formal veneer. The project bid is expected to take some time. The NUH will replace the Alouette series, Cheetahs, and Chetaks. The twin-engine NUHs are to be produced in India under the SP model for which the prime bidder has to be an Indian company in partnership with an OEM. Partnerships already announced include Mahindra Defense with Airbus Helicopters for the AS565 MBe Panther, and the Bell 429 offered in partnership with Tata Advanced Systems (TASL). It is not clear whether Leonardo’s AW109 Trekker will be allowed to participate following the company’s black listing related to a bribery issue of the previous AgustaWestland company. Meanwhile, HAL could also be in the competition with a﻿ naval model of the Kamov Ka-226. The company is building 200 Ka-226T light utility helicopters for the Indian Air Force and Army in a joint venture with Rostec.